In an age where ordering tuna can eat away at the conscience of many a foodie, perhaps a restaurant specialising in the mighty fish may seem a little regressive. 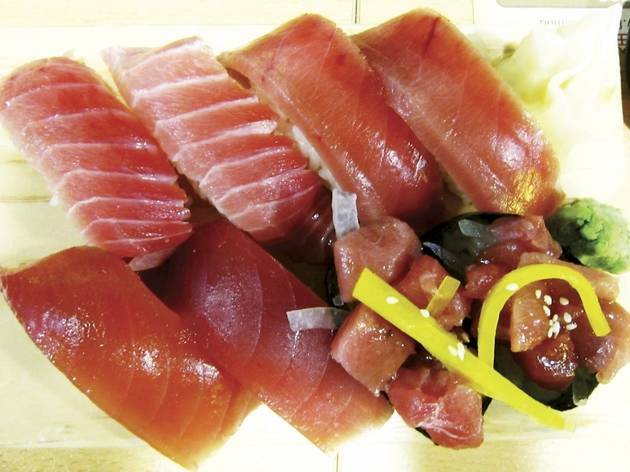 But Soon Yi Tuna Sushi, a popular Taiwanese chain that has just opened its first branch in Hong Kong, isn’t that naïve. It buffs up its eco-credentials to placate nervous diners and keeps prices dirt cheap to entice the rest. 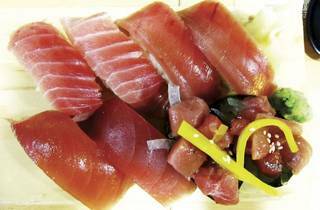 They claim to serve only yellowfin tuna, which at least according to the Marine Conservation Society is currently at sustainable levels. Secondly, an illustration on each placemat depicts their choice of longline fishing; while not without its setbacks, it’s one of the less damaging fishing methods used today. They say their fish is also ‘super fresh’, thanks to their ‘super frozen’ technology where the freshly caught bounty is immediately zapped to -60°C to preserve its quality. All very commendable, and if there were any flair or flavour to the food itself, perhaps Soon Yi would have earned more stars. Straight off, we’ll say that most of the rating is earned by the service, which is warm and eager to please. Our waiter explained the menu with such enthusiasm that we felt sorry he had to peddle such poor-quality fare. The best is the off-menu grilled tuna jaw ($32 per piece), which has us digging at the smoky little nuggets of flesh. On the other hand, a set menu for two ($288) features a weak and one-dimensional tuna miso soup, pedestrian tuna handrolls (points for ultra-crisp nori), tuna sashimi (o-toro, chu-toro, akami) and a selection of so-so sushi, which includes a grapefruit juice marinated tuna gunkan maki. 1/F, Long Wah Bldg, 21 Lock Rd, Tsim Sha Tsui, 2721 1665. Daily 11am-11pm. Dinner for two: around $400.